Comedy is a more important part of the television landscape than ever before, thanks in part to a generation of highly visible creators, writers, and executive producers who balance the work of maintaining a show’s artistic vision while also overseeing its day-to-day operations. In anticipation of the new fall TV season, The A.V. Club spoke to a handful of the people who’ve made the industry term “showrunner” a household word. Today, we talk to American Dad showrunners Mike Barker and Matt Weitzman as well as Jordan Blum, a writer for the series. 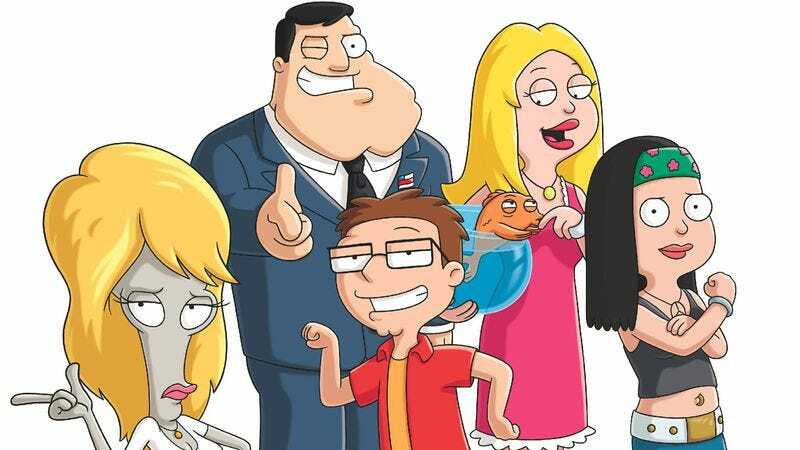 When American Dad debuted, it was written off by critics as a pale imitation of the then-off-the-air Family Guy, as Seth MacFarlane’s attempt to put his old show back on the air, right down to the talking animal (a fish, in this case) and the strange, sometimes malevolent figure living with the central family (an alien, in this case). Yet very quickly after the series’ post-Super Bowl 2005 debut, American Dad began to develop an identity and voice distinct from the earlier series until it became arguably the weirdest show in network primetime, a little blast of surrealism every Sunday night. The often-embattled and low-rated Fox show has survived to begin its eighth season on September 30, becoming an unlikely institution with a backlog of 20 unaired episodes and even more to come. Much of the credit for the show’s voice and weird humor stems from showrunners Mike Barker and Matt Weitzman, who first met MacFarlane as writers on Family Guy, then co-created American Dad with him before taking it over as their own project. They’ve overseen the series for its entire run and will continue to do so for the episodes currently being produced, which will likely air beginning in the fall of 2013. The A.V. Club talked to Barker, Weitzman, and series writer Jordan Blum at San Diego Comic-Con International about how they initially differentiated the show from Family Guy, the limits of serialization in animated comedies, and how the long gap between production and airtime can be harmful. The A.V. Club: Exactly how big is the episode backlog you have right now? Matt Weitzman: We have 20 episodes… And now we’re in the process of developing our ninth season, and so we’ll have an additional 22. So we’ll have 42 more episodes that nobody’s yet seen, and we’re very happy about it. AVC: So the episodes that are going to be airing in the fall were developed in 2010? MW: Yeah, right around there. That’s when we started, and we wrapped up production in August of 2011. AVC: How do you work in a situation like that, where you’re not sure when these things are going to be airing? MB: You avoid episodes that are topical. And you try to write episodes that are timeless. And issues that are evergreen, because you know when you’re breaking the story that there’s a good chance it’s going to be two years until anyone sees it. So hopefully, it’s an issue that will be an issue when the episode airs. MW: Right. So if it’s not an issue, we’re just counting on the idea that in two years it’ll be an issue again. AVC: Have you ever gotten burnt by that? MW: A couple of times. MW: A tragedy! Like we had… Stan was rooting for Virginia Tech [during March Madness]. He wanted the house to himself; he wanted everyone to go out on vacation so he could watch the Sweet 16 in college basketball. And he was rooting for V-Tech; then there was that giant tragedy at Virginia Tech so we had to change Virginia Tech to Georgetown. Jordan Blum: And then there was the Heath Ledger dog, remember? MW: Yes. Yeah, but we didn’t change that after. JB: Greg and Terry had a dog named Heath Ledger. MW: Greg and Terry, their dog’s name is Heath Ledger. And you know… I don’t think the dog is alive anymore either. MB: Yeah, we haven’t really gone back to him. JB: It’s a rich story area we’ll tap into later. JB: Fans are clamoring for the return of Greg and Terry’s dog. AVC: When the show debuted, the beef against it was that it was just Family Guy all over again. How did you work to differentiate it from that earlier show? MW: Tears. Lots of crying. MB: The first thing we did was, we stayed away from flashbacks. That was like the No. 1 mandate: no flashbacks. I mean, if you have to do a flashback, it’s got to be a really good one, and we can’t do it more than once in an episode. That was the main thing. MW: And actually to your credit, Mike, you thought in the beginning when we were beating this out with Seth [MacFarlane] that we should do less of that, and Seth and even I were like, “Oh, but that’s kind of the thing that is Seth,” and so forth. At the time, though, Family Guy was not coming back, so we thought maybe that’s okay. But the moment that Family Guy came back, we were like “No, we can’t do that.” So we just focused on stories and characters. AVC: As the show has aired, it’s gotten weirder and weirder. What’s been most surprising to you about the evolution of the show? MB: That it still exists. JB: That people like that weirdness, right? MB: Yeah, people love the weirdness. So I think we’re just being more truthful to our own strange brains. And the fact that people are out there responding just means that our fans are a lot like us. JB: But I think it is the true voice of the show emerged. MB: Yeah, I think the more strange and subconscious we get, in a weird way, the more truthful the show is. JB: I think the mandate you guys set for us is, “Take a weird concept, but make sure it has a human story that grounds it.” So as weird as we get, it’s always a family story, right? A relationship. MW: Yeah, people kind of walk away because we always get to that weird ending. But it always starts out in a very relatable topic or issue. And then eventually it branches into our own psychosis. AVC: Was there a character that the audience really responded to that you were surprised by? MB: Principal Lewis. I think we always liked Principal Lewis, but it seems like, based on comments we’ve seen on The A.V. Club—pretty much our primary source to find out what our true fans think—we discovered that Principal Lewis was a fan favorite. So we started writing more toward him, and I think the fans realized even before we did that Principal Lewis was a great comedic character. JB: He might even get his own B-story separate from the family this season. We talked about that. MB: Yeah, just a Principal Lewis story without any interaction with the Smiths. MW: And also not necessarily a character, but a character trait, was the fact that Roger was better to put in costume and send him outside of the house, rather than the original concept, which was he was basically going to be ALF and sit in the house and comment on the world. But we learned that he was way too much fun to keep inside, and having him interact with people was giving us too much. MB: Plus, you see that the entire world is fine with a gray alien as long as he’s wearing a wig. JB: He’s a human then. MB: And the great thing about Roger is, he’s basically our guest star of the week. Because every new character that he does, we could have cast someone else to come in and do it, but Seth [who voices Roger] ends up becoming this entirely different character that’s still Roger, yet somehow a brand-new character as well. AVC: What’s something that hasn’t been as successful as you hoped? JB: And it opened up good Hayley stories, but at the end of the day, I don’t think we needed any more talking animals. AVC: The character situations evolve very slowly and change just very slightly. Do you have rules to guide that? MB: We just try to obey basic rules of continuity. We try to avoid stories where a character is taking a big step like marriage and then not going back to it. I think by doing that, then in the future when we have big changes the audience knows that they’re going to be living with those changes for a while. So it’s not just a thrown-away bit. It kind of endows that story beat with more power because it’s going to last. It’s not just going to be a reset button. JB: [Laughs.] If it does, we shine a light on it before the commenters on The A.V. Club do. MB: We like to beat them to the punch. MW: Yeah, we’re well aware that there’s been more than one moment where we have not held fast. MB: I think in season eight, which is shaping up to be a great season and maybe our best yet, we are being even more faithful to absolutely everything that we do. JB: But even in the previous one there’s a lot more seasonal arcs, actually. Hayley has a big one. MB: Hayley has a huge arc this season coming up. MW: Using what we’ve established. JB: Characters have larger arcs that play out. AVC: Does Fox air the episodes in the order intended? MW: Not all the time. AVC: Are there long gaps between production cycles because of that weird pickup situation? MW: Well there were this last go-around, season seven to season eight. There was a good six months where it was all very up in the air. MB: Yeah. We lost some animators, and we lost a lot of writers. Season eight, our writing staff is about 65-70 percent new, which has been a great shot in the arm for the show, just because it’s human nature to grow weary of the same premise. MW: Yeah, it’s healthy for the writers, and it’s healthy for the show. I guess we’ll find out though. MB: It feels like a first-season show to me right now. It feels like we’re in the first season of a show that really knows what it is. So all the guesswork and the experimenting of what the show should be, we’re beyond that, and now it’s just about having a blast and having a real clear idea of what we want to do. JB: It’s ambitious, this one now. Season eight we’ve been doing the biggest stories I think we’ve ever told. MB: Right. And yet they still have great import. Like, the stories are definitely still relatable and human, but yeah, we’re taking some big swings in season eight. AVC: Has there ever been a storyline or something that was just too strange for Fox to sign off on? MB: I tell you, there is one episode that we wanted to do that they rejected, but there’s been a change of guard since then. And I don’t think anyone took any notes as to which one they rejected, so we’re going to try to re-pitch that this year. So I’d rather not say what that episode is until after it’s produced, and then we’ll gladly let you know. “By the way, that was rejected at one time.” But we outlasted the regime change, and that’s all you really gotta do to get your stories in. Just last longer than the executives. MW: But it is surprising how many—I mean we’ve done 153 episodes at this point. And we’ve virtually never been rejected. MB: Except for that one time. MW: Yes. Except for one time. So it’s been surprising that they’ve been willing to let us do what we want to do so often. AVC: What’s Seth MacFarlane’s relationship like with the show, since he has so much going on on a day-to-day basis? MW: Seth is a fan of the show. He loves doing it. I mean, we’re doing another season, so even with the man doing as much as he’s doing in the world, he’s still willing and happy to make time for the show. He’s onboard. It’s great. We’re really, really happy about it. MB: Over the last couple of seasons it seems like Seth has been more excited about the show than in the past, just simply because I think fans are letting him know through his Twitter feed that they love Roger, and they love American Dad. So I think that’s helped him reappraise the show. MW: I think it’s natural for somebody like Seth, who’s so creative—I mean, he had to take a step back because he was focusing so much on Family Guy that American Dad became very secondary to him, and he wasn’t sure what it was. He was going along for the ride, but he wasn’t really sure what the show was because we were all still trying to figure it out. And then as time went on, he realized, “Oh my gosh, these guys are doing something really different from Family Guy, and people are appreciating it.” So I think that he came to realize its value more so than in the beginning, like Mike was saying. AVC: The show has Patrick Stewart as essentially a semi-regular. How did that relationship develop? MB: Yeah, Seth. Seth thought it would be a funny idea to have a Brit as the head of the CIA, and there’s no one better than Patrick Stewart. And from the very beginning, Patrick Stewart just loves doing comedy, and he loves the character of Avery Bullock. He just enjoys it. So we keep writing for him. We have some really fun Patrick Stewart episodes coming up that I think the fans are going to love. But we love writing for Patrick Stewart. He’s one of the funniest actors ever. MW: I think it started because Seth is such a Star Trek: The Next Generation fan, so he was just drawn to him initially. AVC: You guys have been with the show now for eight years. It’s unusual in television to have something go that long. What keeps it rewarding and interesting for you? MW: The paycheck. [Laughs.] No. I think it’s because of the people that we’re working with and the fact that the show is still making us laugh. I love to go to work every day, and I’m grateful to be able to do that. To be able to work with people and do something that I like to do and be able to watch the final product and be proud of it is something that not everybody gets to do. So we recognize that this is something special and not to let it go necessarily. MW: Scott [Grimes] is really good. MB: Seth just makes it so fun to write because he just hits stuff out of the park. I’m still in awe over his comedic abilities. And then the rest of our cast is so fantastic. I think being the underdog for as long as we’ve been the underdog, it’s just given us a certain sense of humility. So whenever we get picked up, we’re always grateful. And then the show’s just a blast to write. JB: Longevity allows you to get more experimental, it seems. When people are familiar with the characters, you can take bigger risks. MW: But we’re looking for it. MB: Yeah, we’re looking for it. We’re trying.